But Model Cellar no longer produce them. Perhaps you have a few Model Sellar trucks? Just some pieces - only a few pieces will be enough to make a diorama. Can I get them from you? We are looking for 1/35 Model Cellar track set for Emhar kits - Mk IV, Whippet, Tadpole. Any pieces or incomplete sets. been an enjoyable project. Here's some final pictures of the little beastie. Thanks for looking. Seeing double is a good thing...when it comes to wings. Fokker looks very nice indeed. Do like the prop. More rigging than you'd think on the Eindecker. (I just bought a Morane Saulnier and expect the same.) Are the turnbuckles these ritzy white metal things - they do look good. Eric, Thanks for the comments. I used .04mm tubes for the turnbuckles. The rigging material is 2 lb monofiliment line. It took a while but I finally saw this one. A real beauty. Thanks, Marc. Coming from you it's much appreciated. If the GB sticks around I might make another kit. Roden has just introduced a 1914 Version of the Rolls Royce Armored Car - accurate for Lawrence of Arabia or British police in Ireland - whatever takes your fancy. Hi all, may I enter with a 1/72 Roden Albatross D3 please ? As long as anyone wants to contribute... with the understanding there not much traffic here... Sure can. Isn't there a WWI figher GB? I am under correction, but I think the other WW1 BG is closed to new entries?? Anyway. 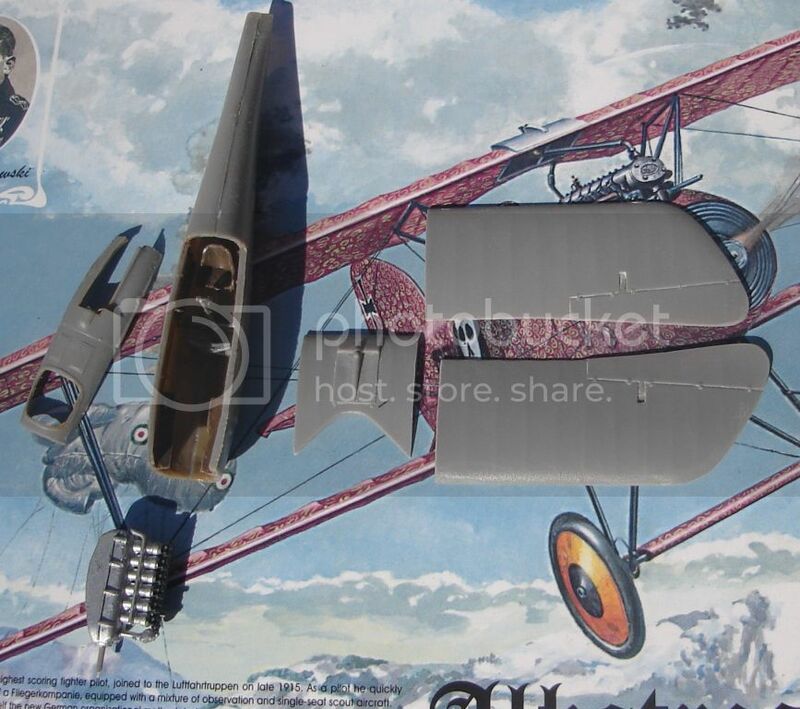 The only other WW1 plane I built was the 1/72 Revell D-7. This little Roden Oeffag 153 1/72 is a real pain for me to build. It seems my eyes are not what they use to be and I find working with it is very fiddly.....but I will beat it into submition! The kit has a very nice engine, the rest of the kit is OK'ish but the plastic seems rather soft with loads of flash. I am basically using it as a learning tool for later WW1 stuff. Fuselarge fit is a little poor, the parts seem to be slightly warped. Rigging this little monster is going to be "fun"!